Helen Sullivan and I have recently been working on a dialogue paper based on the work we have been doing around the future of the public service workforce with Graeme Head who is the Public Service Commissioner for the New South Wales Public Service Commission. This paper appears in the most recent issue of the Australian Journal of Public Administration which, as I have previously described, is now being edited by a collective including myself. The first issue comprises a series of dialogue papers between academics and practitioners on key contemporary themes in public administration. In this paper we explore the issues of the future public services and the nature of work and consider the implications in terms of the public service workforce. We go on further to offer some sense of where New South Wales is taking aspects of this forward in practice. If you are interested in the paper it is currently available for free and can be accessed through the following link. We are currently considering how we might take this research agenda forward so if you have any thoughts about gaps or things you would like to see then please get in touch with me. I just came across this blog from David Halpern (National Adviser on What Works and CEO of Behavioural Insights Team, UK) which is concerned with the lack of empirical evidence used to guide decision making in many areas of public services. In the UK a series of ‘What Works’ centres have been established to generate ‘good empirical studies’ in a range of different welfare service areas. Now I am all for using more evidence to inform policy and practice (working in a university how could I be against this?). Although I suspect that in some of the areas that the What Works teams are talking about it is not necessarily a lack of evidence that is the problem but weighing up a series of complex value judgements. These are typically not easily resolved by more evidence about effectiveness. Helen Sullivan talked about this very same idea in the Imagining the 21st century public servant workforce report which we published last year. What we argued in this report was that if the approach of radical incrementalism is to be effective then the first task must be to ensure that we all have a sense of what we are working towards. We both use the example of British cycling and there I guess the aim is to go faster for longer. The aims in areas of local economic development or early education might be slightly more complex. Without a sense of strategic aim then evidence cannot play the role in the process that it might. In our research into the Australian public service one of the things we heard frequently was the lack of strategic oversight and horizon scanning – and I don’t think Australia is alone in this. Having established where we want to go, having good evidence to back up this process and to help us track progress is, of course, absolutely crucial. I would like to hear from any individuals or teams who have experimented with this notion of radical incrementalism in recent practice and hear about your experience with this. Did it turn out to be as radical as you had hoped? Did you reach the end point? What helped and hindered this process? In this post I summarise some of the various pieces I have authored or co-authored in this research programme over the last few years. Shortly before moving to Melbourne Catherine Needham and I won some funds from the ESRC to form a knowledge partnership with Birmingham City Council. When I left the UK I handed over my part of the project to Catherine Mangan but did stay involve in a less formal capacity. You can find the review of the literature that the three of us did here and which sets out 8 lessons about the future public service workforce. Helen Sullivan and I conducted a research project interviewing about 30 individuals in total to try and get a better handle on what the future Australian public servant workforce might look like and the steps needed to achieve this. This followed up from a discussion paper that Helen did with Maria Katsonis of the Victorian Department of Premier and Cabinet (you can access this here). The final report of the research by Helen and I can be found here. 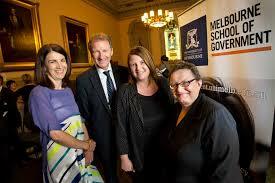 Below there is a picture of Helen, myself, Maria and Sir Gus O’Donnell at the launch of this work. The report from the Birmingham research can be found here. Below is one of the great illustrations that the Birmingham team commissioned to illustrate their research. In addition to these reports a number of pieces have also appeared in public service magazines like The Mandarin or newspapers. I have put links to these below. 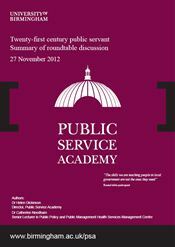 21st century public service: changing education and recruitment. The Mandarin, 13thJanuary 2015. 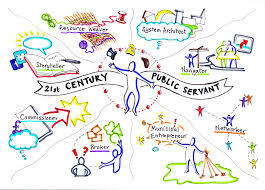 21st century public service: shared vision needed for ‘softer’ skills. The Mandarin, 17thDecember, 2014. Although lots has been written about the need for public services to reform, less has been discussed about how this will impact on the workforce. If we are to plan effectively for the future then it is crucial that we have a sense of what the public service workforce of the future might look like, what roles public servants might play, the skills and capabilities they will need to achieve this and how development and education will need to change. The workforce issue is important not only because of the sorts of changes that are taking place in the public service context, but also as we are starting to see shifts in terms of the nature of work more broadly. Whilst some of the suggested changes to work may be more postulated than real at the moment; what is clear is that we are all going to work for longer, we will likely have several careers over this period and portfolio careers will be become more popular. Over the last few years I have been doing work on this topic in the UK (in conjunction with colleagues at the University of Birmingham) and in Australia. In this category I will bring together some of the publications that have come out of this work, interesting articles that I come across and ideas of where to take the work programme next. If you are interested in this topic you might also want to read the blog that I run with colleagues at the University of Birmingham – https://21stcenturypublicservant.wordpress.com/ We’re always keen to hear about new and interesting ideas, articles or events that might also cover these issues.